Many of AsianInNY’s friends will be performing including Crimson Kings, DJ J4, Black Lotus, PaperDoll band and so on. Join us! Mott Street (from Canal to Worth St), Bayard Street (From Bowery to Mulberry St), Pell Street and, Doyers Street. 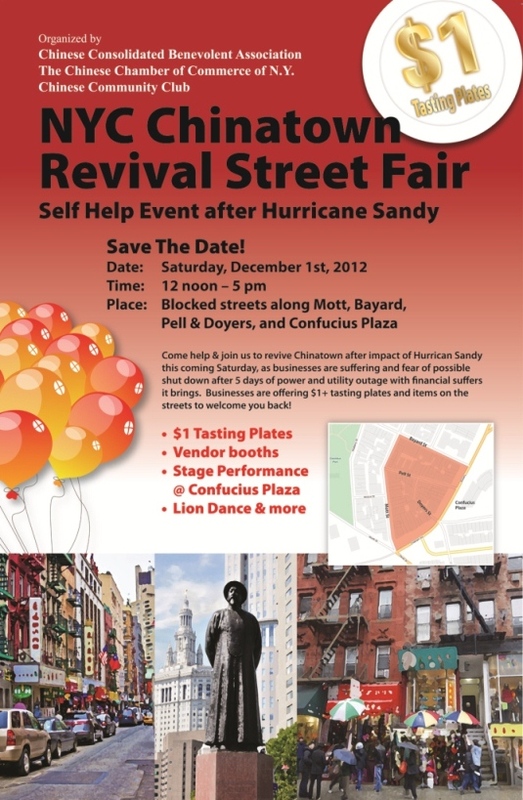 The Chinese Consolidated Benevolent Association (CCBA) and The Chinese Chamber of Commerce of New York (CCCNY) would like to invite you to a large-scale street fair on Saturday, December 1 2012, from noon through 5:00 PM. Throughout the past two weeks New York City was paralyzed by Hurricane Sandy. Businesses in Chinatown suffered significant losses and are still experiencing an economic crisis. Many small businesses were unable to continue with their normal routines due to the loss of power, water and heat. Following the hurricane, tourist population and consumption declined so drastically that Chinatown’s business operations descended to a ten-year low. Although New York State and City government offices have employed numerous resources and a large amount of manpower in attempts to rebuild New York City, we must also help ourselves to swiftly relieve and revive the economy in Chinatown. In order to recover from these straitened circumstances, we as Chinatown’s businesses must unite together and solve our problems collectively. The Street fair will cover the areas of Mott Street (from Canal to Worth St), Bayard Street (From Bowery to Mulberry St), Pell Street and, Doyers Street. There will be a stage in front of Confucius Plaza Square, adjacent to Bowery, and our splendid performances will touch upon singing, dancing, Chinese martial arts performances, etc. At noon, a Lion Dance will join the show while the representatives from the Major’s office, John Liu, Margret Chin, Peter Koo and other elected officials join our Communities’ leaders at the ribbon cutting ceremony. No user commented in " Chinatown Revival Fair "